This ‘90s classic is making a comeback. The Air Jordan 10 Retro ‘Powder Blue’ is here and stays true to the original colorway. It features a tumbled leather upper and a signature elastic speed-lacing system. It rocks a Powder Blue padded collar and on the outsole, a listing of MJ’s career achievements. If you’re interested in copping a pair this Saturday, check out our release details below. In partnership with mall management, SELECT Foot Locker and House of Hoops by Foot Locker stores will implement a sweepstakes ticket procedure* in order to purchase the Air Jordan 10 Retro “Powder Blue” (on sale 2/22/14 for $ 170). The sweepstakes tickets will be given out Wednesday, February 19th and Thursday, February 20th. If your ticket number is selected, you will be notified by phone on Friday, February 21st. These procedures are for SELECT STORES only. To find out which store near you will carry the shoe and if that store will implement the sweepstakes ticket procedure, please visit the Foot Locker Launch Locator. The full family sizing run will be available – Grade School – Infant. This release will also be available on Footlocker.com starting at 8:00 a.m. EST starting Saturday, February 22nd. 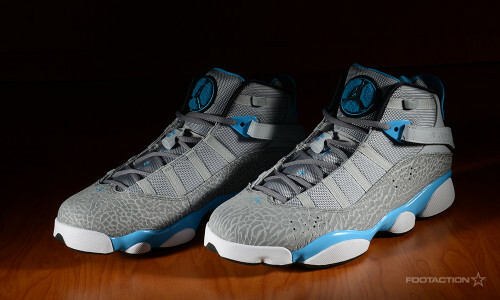 Jordan Brand brings back the Jordan Six Rings in “Powder Blue” to kick off the new year. The Jordan Six Rings celebrates the championships that Michael Jordan has won, by mixing in classic elements from each shoe he was wearing while winning championships. The upper consists of Cool Grey and Wolf Grey with elephant print along the overlays. Powder Blue is present throughout the midsole, Jumpman logo, heel tab and additional accents for a vibrant color pop. This hybrid silhouette is set mostly in two tones of grey, using its nickname for detailing rather than prominence. The Air Jordan 1 94 “Powder Blue” brings forth the famous checker print on the lining as well as a translucent outsole, gaining inspiration from the Air Jordan 10. This rendition of the ’94 favorite takes its original color, styling and shape, while a white leather upper is contrasted by a wavy tongue. The “Powder Blue” nickname is given by the sneaker’s accents. 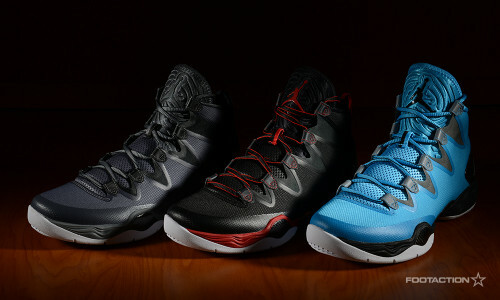 The Air Jordan XX8 SE is a deshrouded, reimagined version of the Air Jordan XX8 dropping in new styles just in time for Spring. Drawing inspiration from mainstay Jordan colorways, the sneaker arrives three different palettes: Powder Blue, Dark Grey and Black/Red. The shoe also comes equipped with Nike Zoom Air units for cushioning and a lightweight midsole with Flight Plate technology offering stability and support with a multidirectional outsole providing excellent traction. Taking a look at the Air Jordan 3 Retro “Powder Blue,” the classic Jordan’s feature a Powder Blue leather upper with hints of black on the elephant print, tongue and midsole. The Air release of the shoe marks 2014′s first Air Jordan 3 release. The distinctive colorway is a way to recontextualize and reinvent a classic shoe. What do you think about the eye-catching look and colorway of this sneaker? Releases in stores and online on Saturday. Check out Release Locator for stores and release details. The first Air Jordan 3 release of 2014 gets the “Powder Blue” treatment this Saturday, January 18th. 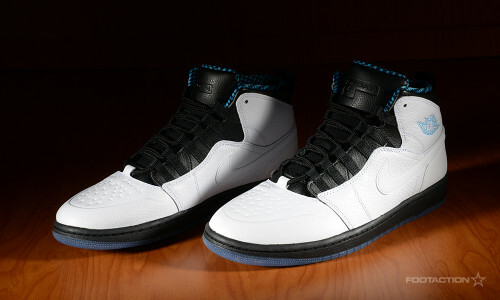 These classic J’s feature a Powder Blue leather upper, with hits of black on the elephant print, tongue and midsole. White is also showcased on the midsole and prominently on the Jumpman logos on the tongue and heel. To see how you can score a pair these kicks this Saturday, check out our release details below. 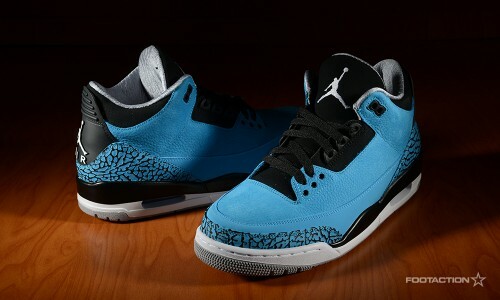 In partnership with mall management, SELECT Foot Locker and House of Hoops by Foot Locker stores will implement a sweepstakes ticket procedure* in order to purchase the Air Jordan 3 Retro “Powder Blue” (on sale 1/18/13 for $ 170). The sweepstakes tickets will be given out Wednesday, January 15th and Thursday, January 16th. If your ticket number is selected, you will be notified by phone on Friday, January 17th. These procedures are for SELECT STORES only. To find out which store near you will carry the shoe and if that store will implement the sweepstakes ticket procedure, please visit the Foot Locker Launch Locator. This release will also be available on Footlocker.com on Saturday, January 18th starting at 8:00 a.m. EST. Kids sizes in grade school, pre-school and infant will also be available both in stores and online.